When I first saw the pictures of pre-production models of the Sony Ericsson Xperia X1, I thought this was simply an amazing phone! That was way back in February this year. that it would have the sexiest eye-candy of a screen that any phone would die for! And the the most intriguing bit of all was that this would not be made by SE! Instead, it will be crafted by the equally expert hands of HTC. 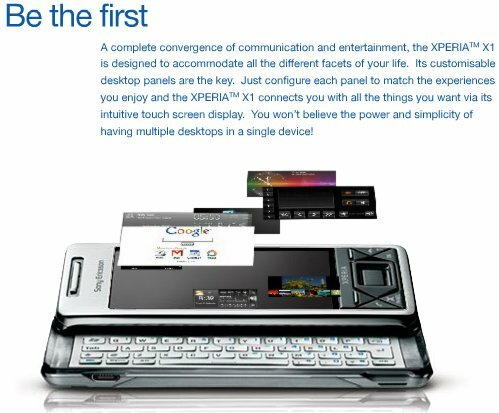 But the phone won't be available until September 08. That was quite a bummer... Imagine having to wait another 7 months before you get to see it! In September, I just couldn't wait, and had to do something.... so I wrote a post on the X1 instead. AARGH!! The launch in end September was only for some European countries and the UK. Countries in ASEAN will just have to wait some more!! So here we are, in the middle of November 2008 -- a good 9 months after those early sneak peeks. SE Malaysia started the hype with a full-page newspaper add 12 days before the launch. Yesterday, another add reminded readers that there's still another 5 days to go... and threw in another hook -- signup via their site at www.bethefirstx1.com for an opportunity to pre-order the phone. The add also noted that if you're the first 50 to buy the phone at the special launch in 1 Utama, you stand to get savings from RM250 to RM1500!! At the time of writing this... its another agonizing 4-day wait. But hang on... am I seriously going to get one? Word is that its going to cost RM 3000! Ouch, yeah. Not a very pocket friendly price in these difficult economic times. But hey, I can still ogle at it if I'm not going to buy it right? Oh, and they'll only have it in black on Nov 22nd. Dang! So what do we do in the mean time...? We do what tech geeks do ... read up on reviews (warning, all is not rosy though... !) here, here and here! And until I really do get a new phone..... I'll still have my trusty, if not somewhat quaint, M600i to meet my calling, texting and synchronising needs! PC, aiyo, I tell you, my friend.... its is *darn* tempting!!! Angeline, don't fret... the X1 lands in Malaysia this 22nd November.... 1 Utama, to be more precise! Hi Sting, tell you what, you'll be among the first to know if (and when) I get it.. how about that? And yeah, you're more than welcome to taking it for a test drive or two! Windows Mobile seems pretty poor to me - not just boring!! It's on my samsung omnia, and it's too unresponsive for my liking, especially when web surfing. Yup, unfortunately until Windows Mobile starts slimming down, or when phones get some serious processing power, putting more bling on WM is only going to bring things to a further crawl! Question for ya... if you had another chance at it, would you still have bought the Omnia? I would love to have one!!!!!! But where I live all the fucntions he has wont work so far!!! !